The Kayalu KLR-5455-T Locking Suction GoPro® Hero Camera Mount provides a unique opportunity for you to secure your GoPro Hero camera (all models) with a loss-proof camera adaptor, a rugged, aerodynamic extension arm and a locking vacuum cup design similar to the mechanical suction cups used by professional glass installers. The KLR-5455- T is constructed of premium-grade materials, all suitable for use in freshwater and saltwater environments. The height of the KLR-5455-T is 15" (38 cm) from the bottom of its suction cup to the base of the camera. With a slightly larger Toughbar extension arm (see Options below) the height increases to 17" (43 cm). 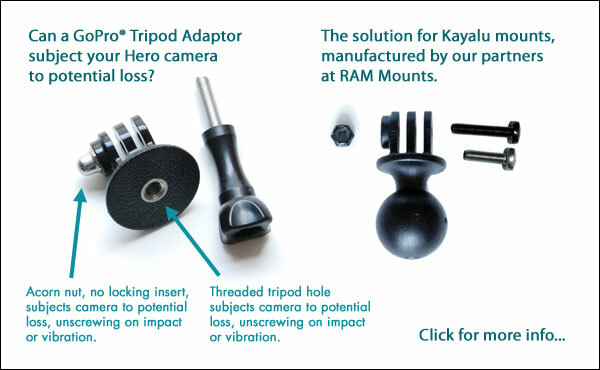 Because the Toughbar® extension increases leverage at the base of this mount, the KLR- 5455-T includes an anodized aluminum RAM diamond ball above the suction unit (as shown in image with specifications, below) — not a high strength composite ball suitable for shorter mounts as we ordinarily include in our Locking Suction mounts. At the base of the KLR-5455-T is one of two RAM Mounts coupler arms — this lower arm is spring loaded for convenient adjustment. At the upper end of the Toughbar® extension rod is a second RAM Mounts coupler. Both of these couplers have large handles which can be loosened for positioning your Hero in a wide variety of positions, and locked into position with a single hand. 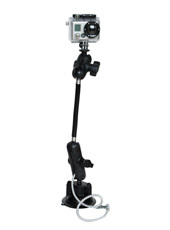 At its head, this mount has a fiberglass composite adaptor compatible with all GoPro® Hero models. Because this adaptor fits the GoPro housing directly, the GoPro tripod adaptor ordinarily required to mount a Hero on a camera mount is not required. The GoPro adaptor ball eliminates the need for a factory GoPro tripod adaptor and additional components on the mount to screw into the tripod adaptor. 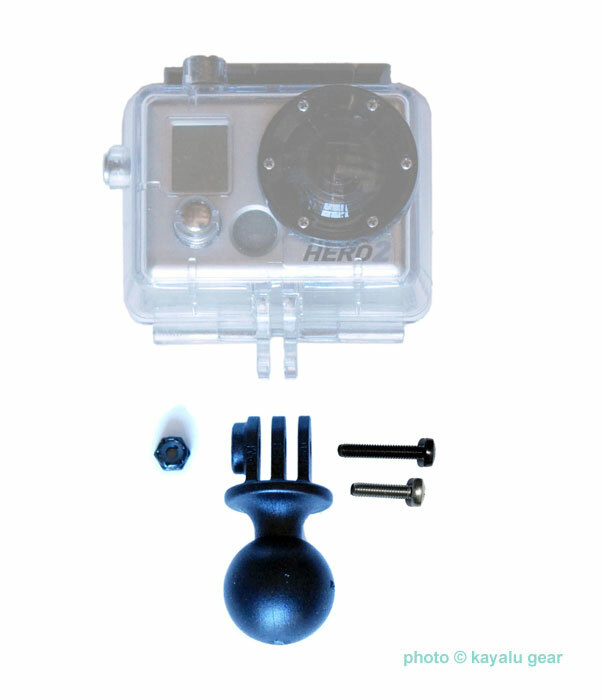 For active paddlers and outdoor enthusiasts, this GoPro adaptor ball provides a virtually loss-proof method of attachment between camera and mount while allowing for quick release of the camera, eliminating the possibility of the Hero unscrewing at the base of the factory GoPro tripod adaptor. Secondly, the adaptor ball's stainless steel bolt and nylon-insert locknut further eliminate the possibility of loss of the Hero by its use of a locknut in place of the standard GoPro thumbscrew and acorn nut. IMPORTANT: The GoPro adaptor ball is constructed of fiberglass composite, significantly more rugged than the thin ABS plastic used to manufacture the factory GoPro tripod adaptor. This GoPro adaptor ball includes its own stainless steel hardware -- bolt, washer and locknut. These hardware components work in friction with the GoPro Hero housing and are HIGHLY RECOMMENDED as an alternative to the GoPro thumb-screw in order to provide a tighter, loss-proof method of attachment between the camera and mount. 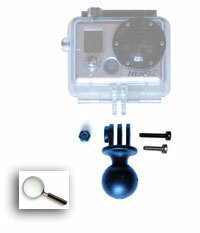 To read more about the GoPro Hero Adaptor in a new window, click here. The RAM Mounts locking suction cup at the base of this unit (image at above left) provides an exceptionally strong grip by comparison with competitive suction-based mounts. The mount can be affixed to a glass window, fiberglass kayak, car fender or a boat windshield by power-locking its vacuum grip to the surface through the action of a mechanical lever arm. And when you want to remove the mount, you simply twist the lock counter-clockwise and pull up a small rubber tab. To enhance the functionality of our KLR-5455-T industrial quality GoPro Hero mount, we include a marine-grade, nylon-coated bungee tether and a plated steel breech clip, which allow you to secure the mount in the event that the mount is bumped or the suction becomes disengaged. The KLR-5455-T ships completely assembled.